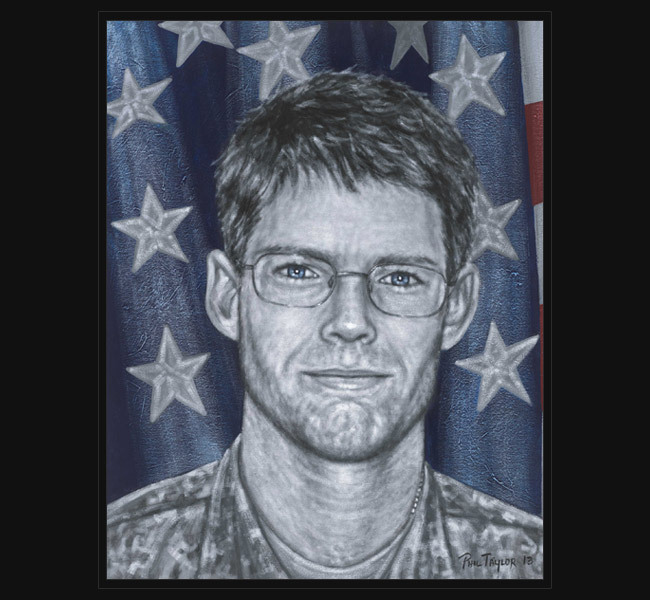 SGT David Leimbach died May 25, 2008 of wounds sustained when his unit was attacked by enemy small-arms fire and rocket propelled grenades while they were assisting in the recovery of a stolen vehicle near Bala Baluk, Afghanistan. “He was a brave Soldier who served his country with honor and valor,” Guard commander Major General Stanhope Spears said in a statement. David had served 4 years in the Marine Corps and joined the Marine Corps Reserve after 9/11. When most of the state’s Guardsmen returned in early May, David stayed behind in what was to be an extended tour of six months. SGT David L. Leimbach was 38 years old from Taylors, SC. Original portrait was presented April 26, 2013 to his wife during a special concert hosted by the City of Florence, South Carolina, featuring Danny Koker, the Marshall Tucker Band, and the Charlie Daniels Band.